I visited my friend’s home last Friday. He is also a pallet crafter, he is so obsessed with his work that he simply never finds out some time to see his friends. He is always busy in some new pallet craft ideas and explorations. 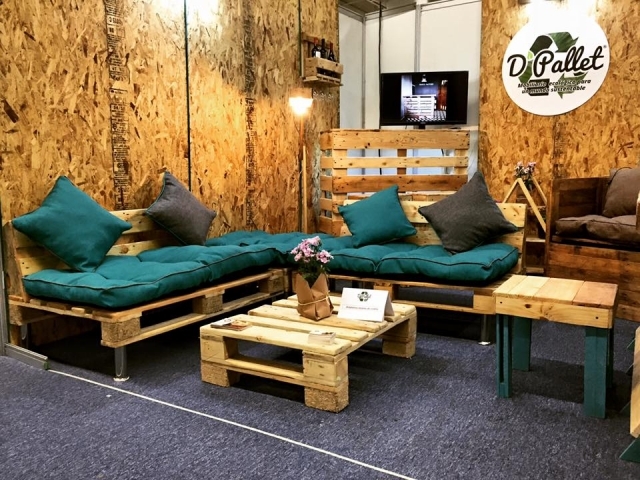 I saw there a number of recycled pallets wood furniture items in his house, and they were so irresistibly great that I just thought to share one with you guys. In this article we would be showing you some of my friend’s pallet wood creations that would literally leave you speechless. Before picking one, we had a heated argument. 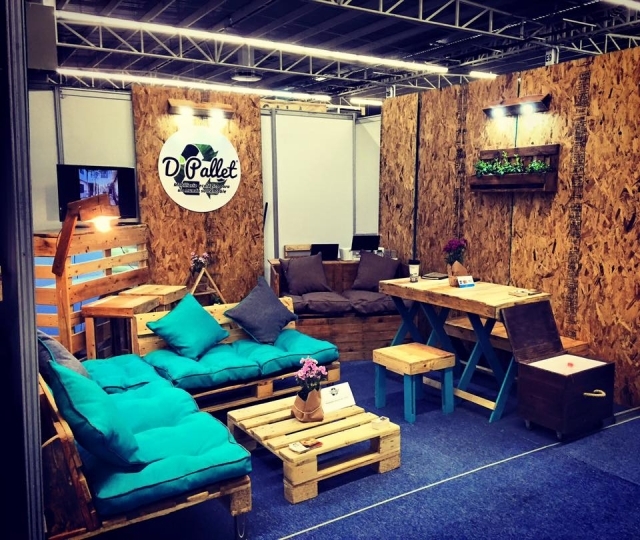 He was of the opinion that the pallet wood is best in its rustic color, you just don’t need to add any stain or paint to the pallet wood creations. While I was of the view that the colors make these wooden pallet creations even more attractive. If you are also a crafter we can have a little chatter here. Though most of our pallet projects are left unstained yet I like the ones which are painted accordingly. 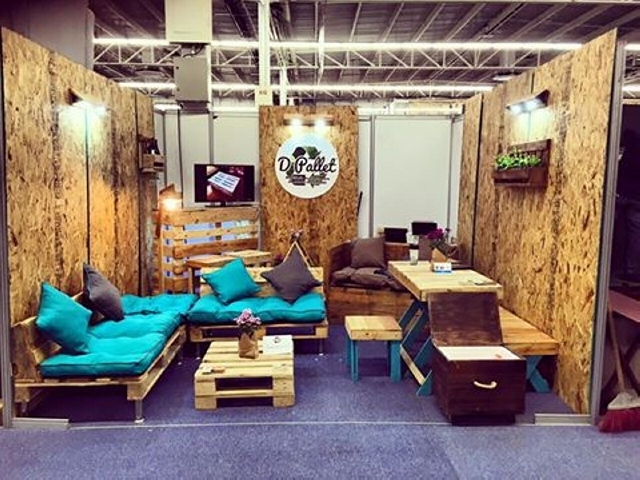 Here is a complete furniture range made with the pallet planks, you can make the amendments according to your desire. We are presenting them in their pretty rustic color. 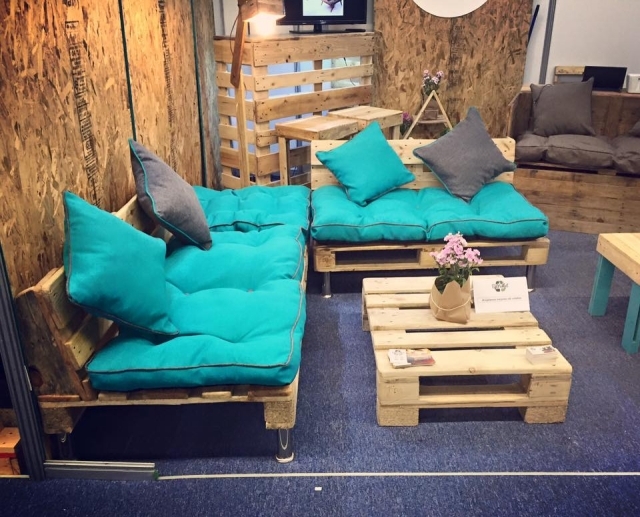 Here is a five seater pallet couch, a rough yet attractive centre of coffee table. We have traditional stool here, and a different huge pallet wood couch too. The entire furniture range is complimenting to the room interior. The pallet sofas have got reclaimed metallic round legs just to add a bit of industrial touch. While the color scheme of comforters and couches are also commendable. This one really deserves a try. You just need a bunch of some fresh pallets if you have to leave them unstained, or else the deteriorated ones could also be used.